For another organ, see larynx. 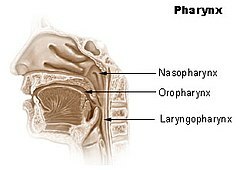 The pharynx is an organ in the back of the throat.it is also the meeting point of digestive and the respiratory systems. the opening of the respiratory system in pharynx is called glottis. it is guarded by a cartilagenous flap called epiglottis which prevents entry of food or liquid into the respiratory system. it closes during swallowing action. As such, it is part of the gastrointestinal system. It comes after the mouth and before the esophagus. Food and air go through the pharynx. The pharynx keeps food and liquids out of the lungs. This page was last changed on 7 February 2019, at 16:53.